What Day Of The Week Is May 18? 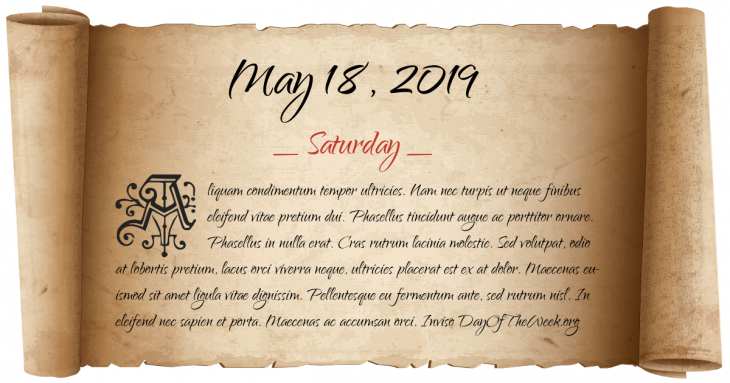 May 18, 2019 is the 138th day of the year 2019 in the Gregorian calendar. There are 227 days remaining until the end of the year. The day of the week is Saturday. Napoleonic Wars: The United Kingdom revokes the Treaty of Amiens and declares war on France. The Disruption in Edinburgh of the Free Church of Scotland from the Church of Scotland. The United States Supreme Court rules in Plessy v. Ferguson that the “separate but equal” doctrine is constitutional. World War II: Battle of Monte Cassino – Conclusion after seven days of the fourth battle as German paratroopers evacuate Monte Cassino. Jackie Cochran becomes the first woman to break the sound barrier. In Ireland, the government launches a crackdown, with the leading Dublin pirate Radio Nova being put off the air. Shawn Nelson, 35, goes on a tank rampage in San Diego. Who were born on May 18?